B&E Storage and Transfer has a fleet of company-owned fleet of tractor-trailers and customized intermodal service to and from the Port of Baltimore. Also available is our 500 mile overnight road service for transcontinental distribution. 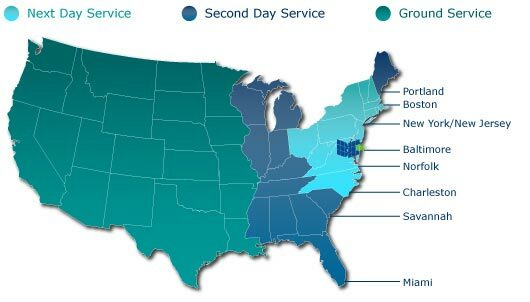 This service is available in the mid-Atlantic region and northeast region of the U.S. Customized solutions for time sensitive shipments are available to meet your company's specific requirements. B&E Storage and Transfer has on site indoor and outdoor rail service. We accommodate rail service across the continental U.S. A Norfolk Southern (NS) and CSX Rail Premier Provider, also a member of the North American Domestic rail network, we are linked to a nationwide network of 600 rail served warehouse in the U.S. B&E's trans-modal services include Rail-In/Truck-Out and Port-to-Rail services to provide your company with cost-effective, efficient supply chain transport options. 600 rail served warehouses in the U.S.